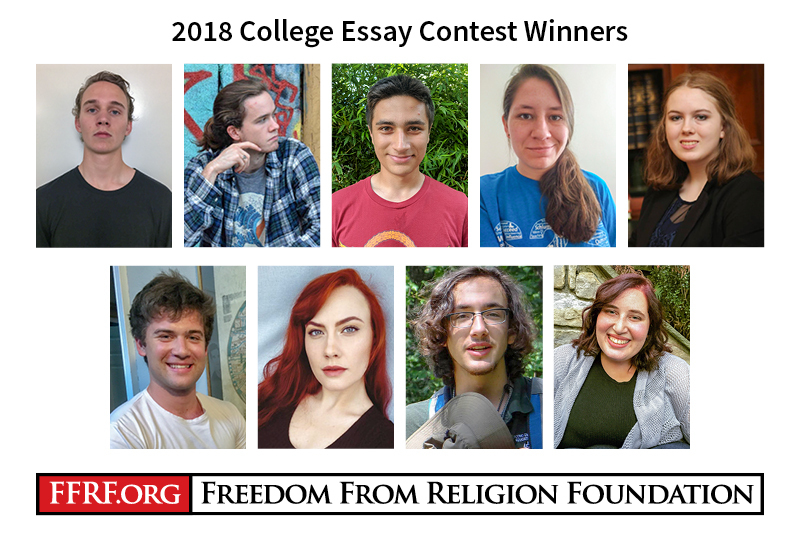 The Freedom From Religion Foundation is proud to announce the 18 winners of the 2018 Michael Hakeem Memorial College Essay Contest. College students were asked to write a personal persuasive essay about, "Why you are an unabashed freethinker, and not afraid of burning in hell." Winners are listed below and include the award amount and the college or university they are attending. Major winners are pictured above. FFRF has offered essay competitions to college students since 1979. This contest is named for the late Michael Hakeem, a sociology professor who was an FFRF board chair and active atheist known by generations of University of Wisconsin-Madison students for fine-tuning their reasoning skills. “We firmly believe our scholarship program rewarding young freethinkers is one of FFRF’s most important activities,” says FFRF Co-President Dan Barker. FFRF has offered essay competitions to college students since 1979, high school students since 1994, and graduate students since 2010 and since 2017 a contest geared directly specifically to students of color. The winners for these contests have already been announced. The graduate student essay winners will be announced in the November issue of Freethought Today. FFRF has paid out a total of $12,750 in award money for this contest this year. FFRF thanks Dean and Dorea Schramm of Florida for providing a $100 bonus to students who are members of a secular student club or the Secular Student Alliance. The total reflects those bonuses.